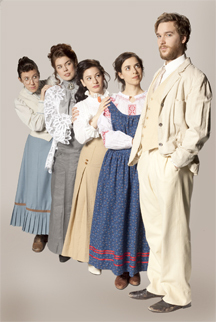 Wild Honey – Tech Weekend! As I write this I am scurrying around my kitchen packing my bag for tech weekend for Wild Honey – it’s been a fun few weeks of rehearsal, and now we put all the pieces together to see what we’ve got. We had our photo shoot with Tim Matheson this week, as you can see by the fabulous photo to the right, we’ve seen the brilliant set by Amanda Larder coming together in the Freddy, and now it’s time to tech, dress, preview and off we go! I’ll be updating this page throughout the day (10AM-10PM baby!) 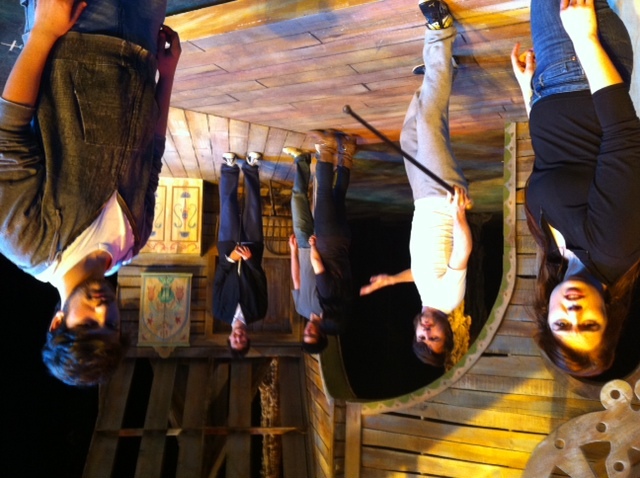 so check back to see what the Wild Honey cast and crew are up to. Here goes! cheese and peanut butter. They may need to let out our costumes after this weekend! Now we’re running through the scene changes – one includes two moving trucks, all the fly rails, and the entire cast. 12:35 AM: Cue to cue begins! As an actor, this means time to be quiet and stay out of trouble. at the Freddy Wood, and we’ve started to set up our makeup stations. table playing Slap-Jack, Speed, Nerts and Solitaire. It keeps us entertained and out of trouble, even if we’re shouting and bruising each other as we do it! 4:35 PM: Still cue-to-cueing. Food is almost gone. 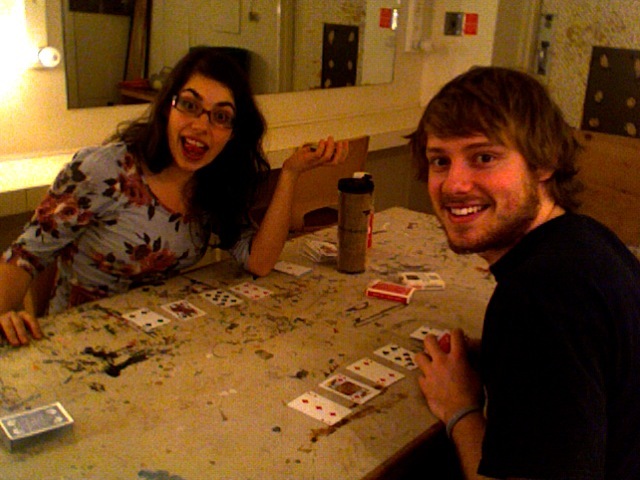 Many rounds of cards have been played. I have my slippers on! Being good little actors and staying nice and quiet. 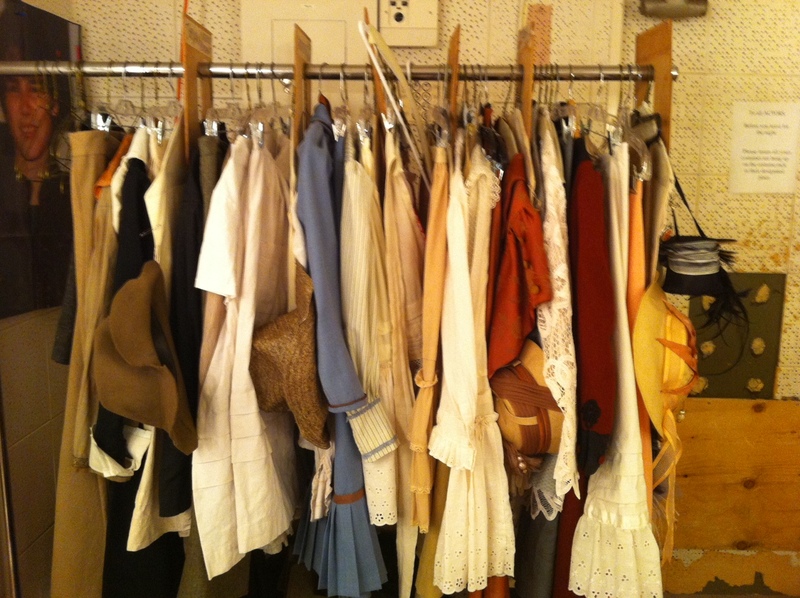 6:17 PM: The costumes have arrived in the dressing rooms. I can’t wait for the dress rehearsal tomorrow. I am not on for about an hours worth of stage time which translates to many hours in tech time. More card games for me! Costume racks - note the Justin Bieber poster on the left. 8:11 PM: The boys have rigged up a massive projector screen to play the Canucks game while we wait for our cues. Awesome! 9:31 PM: Cue to cue is almost done – we’re just putting together a complicated special effects sequence. Curious? You’ll have to come see the show to find out. But it’s pretty much badass. This entry was posted in Uncategorized and tagged acting, practice, theatre. Bookmark the permalink.